Create a smarter, louder noise for your brand with the smartest social media tool. These days, to promote your brand online, you need to be in social media, preferably at all networks and at the same time. You need to spread the word about your content, talk to customers, find new prospects and engage with influencers. Otherwise the rest of your marketing efforts will fall flat. But with so many networks (Facebook, Twitter, Google+, LinkedIn, and more) it can be pretty daunting trying to keep everything up. In many cases, you’d need personal and corporate profiles at each network, so logging in and out alone can take a ridiculous amount of time, not to mention updating accounts and joining relevant conversations. Huge coverage: Facebook, Twitter, Google+, LinkedIn, YouTube forums and blogs. Multiple social accounts: Manage accounts for the people your represent. Easy posting and messaging: Comment, retweet, reply, PM, and more. Flexible dashboard: Customize your workspace, find relevant talks. Advanced scheduling: Have your social media stream set beforehand. Hide your real location: Post from behind a proxy if needed. 30 days of unconditional money-back guarantee: This condition alone leaves no room for hesitation whether or not to purchase BuzzBundle at 65% off. Grab the deal and take you time to see if the software really works for you. In case you feel it doesn’t (which you won’t!) you’ll get a refund – no questions asked. 6 months of maintenance updates: As a bonus to your BuzzBundle license, get half a year of maintenance updates for free. These updates allow developers to keep BuzzBundle in line with the changes of particular social networks and other data centers. After 6 months, the updates will be provided on a paid basis, starting at $3.05/mo. Premium support: If you have any question about how BuzzBundle works, don’t hesitate submitting a ticket or joining a live chat with our Support. You’re sure to get a quick and helpful reply. Bug fixes and new features: The team of dedicated developers supports BuzzBundle, making sure bugs are fixed in time and new value-adding features are introduced regularly. 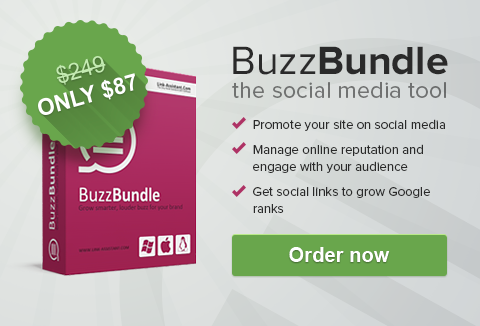 With BuzzBundle, you’re in good hands and always on top of the social media game. Heads-up on important industry news: In addition to be the finest software, BuzzBundle team will regularly update you on the latest happenings in online marketing world. Enter your Name, Email (you don’t need to do this if you are logged in). Click ‘Buy Now’ button below. You will be redirected to the Information page. Fill in the necessary info and submit.